There was a BBC series recently in which writers talked about their writing habits, which got me thinking about Shakespeare’s writing habits. The conversations the writers in this series had with the show’s presenter took place in the rooms where they wrote, and the show was mainly about where writers write. It’s interesting how so many writers cannot write anywhere but one place, where they feel enough at ease to let it flow. The rooms were all so different and ranged from sheds at the bottom of the garden to splendid, luxurious halls, but for the most part they were just rooms that had, over the years, taken on the personality of the writer. They were usually untidy – cluttered with towers of books and piles of ragged paper. Walls were lined with office cupboards and sagging shelves and there were glasses, coffee cups, ashtrays, and many other signs of the preoccupied writer, but they were all different because of the stamp they had been given by the writer’s personality. Anthony Trollope, one of the most prolific English novelists of all time, didn’t need a room: he could write anywhere and at any time, and he did. He was a senior official in the Post Office when the Post Office was establishing the postal system around the Empire and it was his job to go to those far-flung places and set the service up there. He wrote every day, in ships, on boats, on trains, on camels, and in hotels. He never wrote less than two thousand words a day. When he was in England he went fox hunting every morning, then wrote two thousand words and went to work after that. The most prolific English writer, Barbara Cartland, stayed in bed every morning, surrounded by pink furnishings, dictating her novels to a secretary, and wrote, on average, a novel every two weeks. No-one could compete with Barbara Cartland but Shakespeare, like Trollope, was nevertheless one of the most prolific English writers. We know Shakespeare’s plays so well and we know the broad outline of his life but the details of his daily life elude us. What would be of special interest to other writers – his writing habits – are unknown. Did he sit propped-up in bed like teenage poets and diarists do today? Did he sit in an armchair? 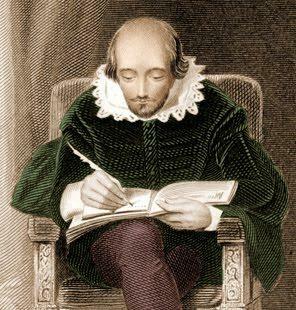 Could he write when he went home to Stratford? Did he write on the coach as he travelled? There is some suggestion that he did some of his writing in the theatre itself, responding to the actors as they explored a text that had already been started. He reveals an intimate knowledge of London pub life in his plays so perhaps he sat at a table in the corner of a Fleet Street pub, writing. Or perhaps he had a study in his lodgings, with a table with inkwells and quill pens, and it was the only place where he could write. Sadly, the fact is, we did will never know how Shakespeare’s writing took place, but wouldn’t it be great to go back in time and find out? Shakespeare’s “Real” Ophelia Finally Revealed? “B, or Not a B?” – Patrick Stewart Rocks!